Father’s Day is next weekend and so begins my mad scramble to figure out what to do for my dad and my husband. 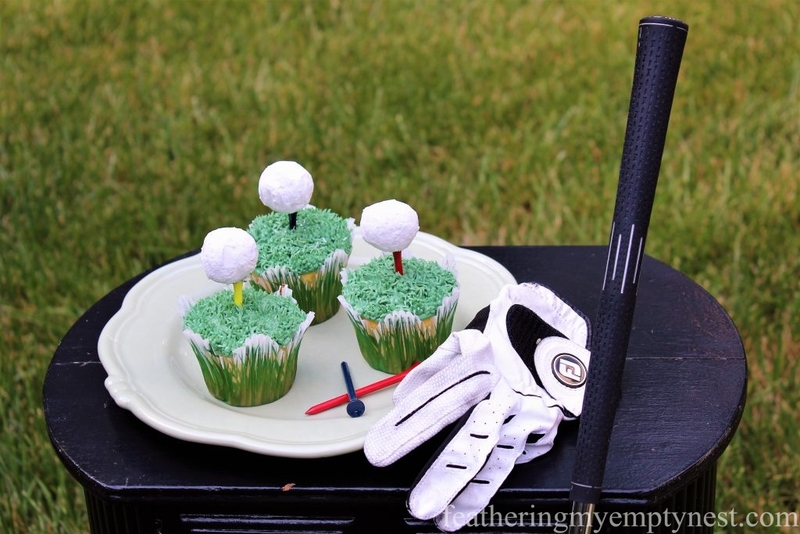 Both are avid golfers, so I thought I’d make some golf-themed cupcakes this year. This is not my first go-round creating such golfing goodies. 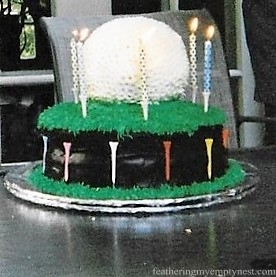 Many years ago, I made a giant golfball cake for my Dad’s birthday. To save time, I decided to use a mix. I like Duncan Hines because I think, their Classic Yellow Deliciously Moist Cake tastes particularly good for a box cake and is indeed quite moist. 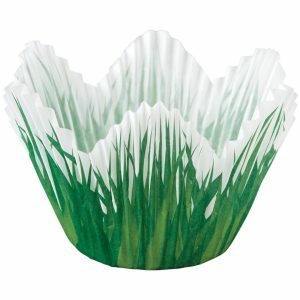 Once I prepared the batter, I baked them off in these Wilton grass cupcake liners, but plain green cupcake papers would do just as well. Also, to save time, I chose to use store-bought frosting. 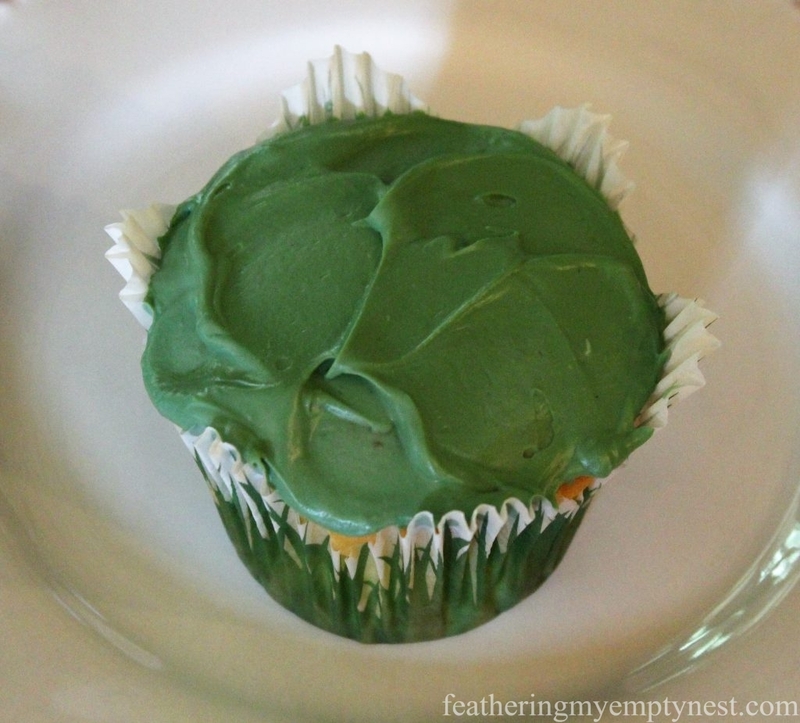 I placed a can of Duncan Hines Creamy Homestyle Classic Vanilla Frosting in the bowl of my mixer and added a bit of Wilton Gel Food Coloring in Leaf Green. I felt that the resulting color was a bit too yellow, so I added a tiny bit of Royal Blue coloring to achieve an appropriate grass color. Using a small offset spatula, I covered the fully cooled cupcakes with a thin layer of icing so that the cake would not be visible through the piped grass icing. I then filled a disposable icing bag, fitted with a Wilton #233 icing tip, with the rest of the tinted frosting (bag should be about half-full). 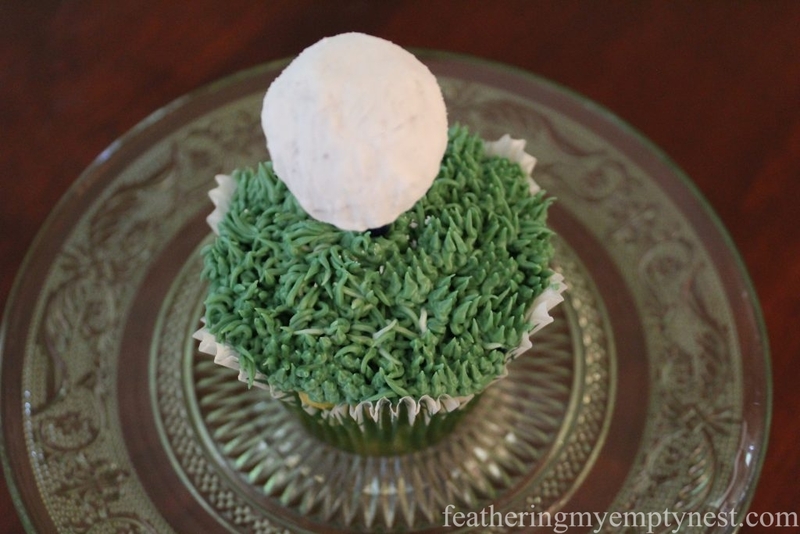 Use a #233 Piping Tip for making grass or fur on cupcakes. 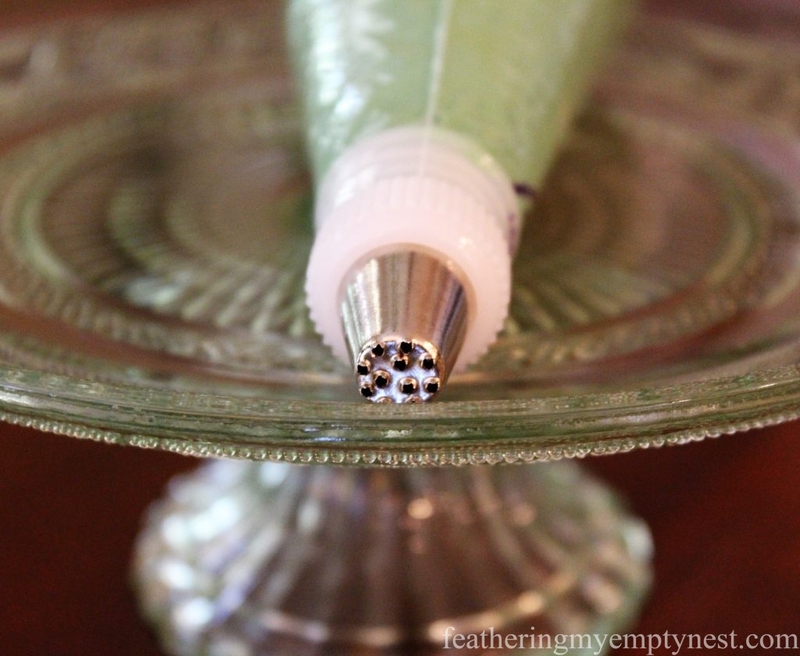 As long as your icing is a medium-firm consistency, (put the icing bag in the refrigerator for a few minutes if it needs firming up) piping grass with this tip is one of the simplest cake decorating techniques to master. All you have to do is hold the bag at 90 ° straight up and squeeze the piping bag to form multiple blades of grass. Pull up and away when the grass icing strands are long enough (about 1/2 inch); stop the pressure and pull the tip away. 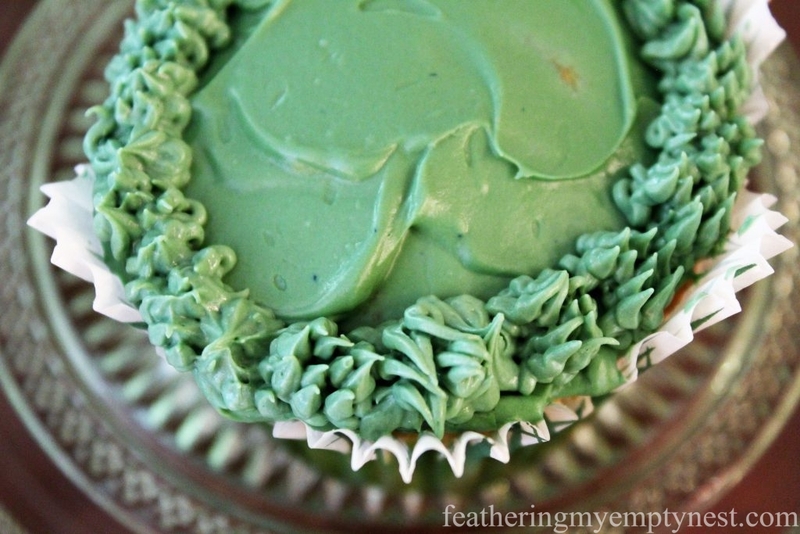 I like to start piping the grass around the edge of the cupcake working towards the center. Check out this excellent YouTube Tutorial to see the technique demonstrated. 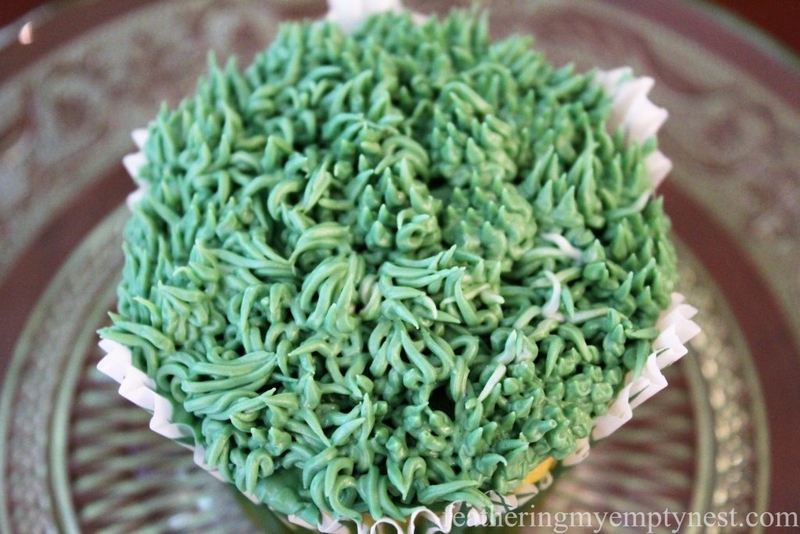 If piping isn’t your thing, you can easily tint coconut with green food coloring and just sprinkle it on top of your green icing to make grass. 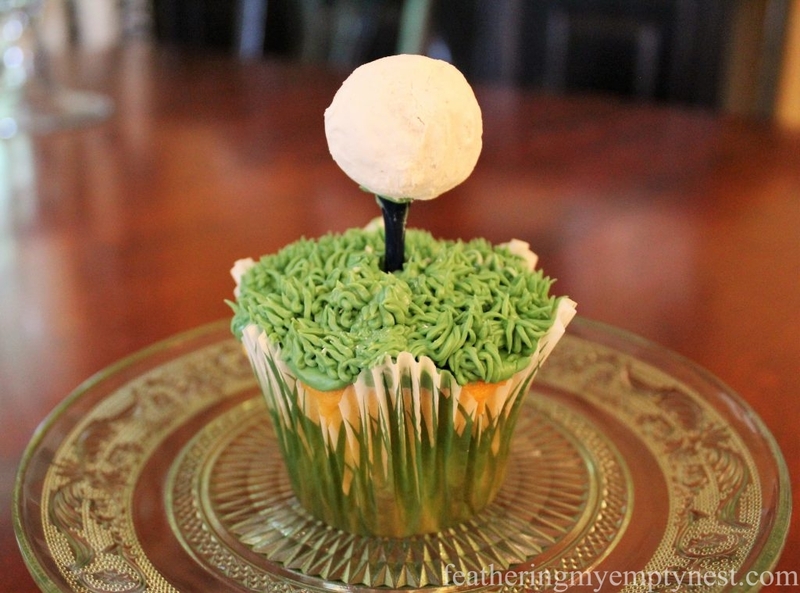 After completing all the grass, I just pushed a 3¼” wooden golf tee into the center of the cupcake. I then used a dab of frosting to adhere a powdered-sugar donut hole to the top of the tee. You might have to push down and hold it there for a minute or two to get it to stick. 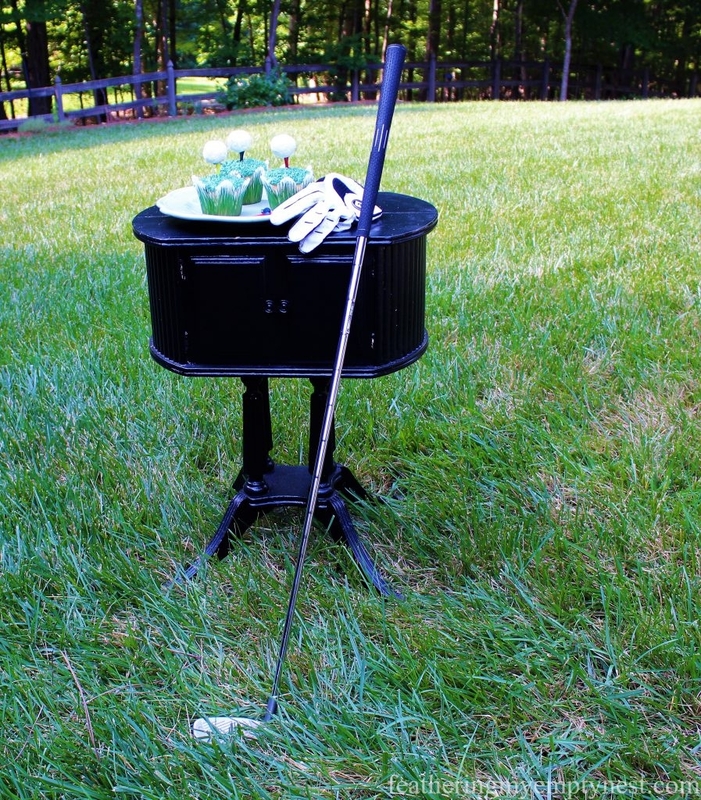 A donut hole “golf ball” sits atop a colored wooden tee just waiting for your day to approach the ball. 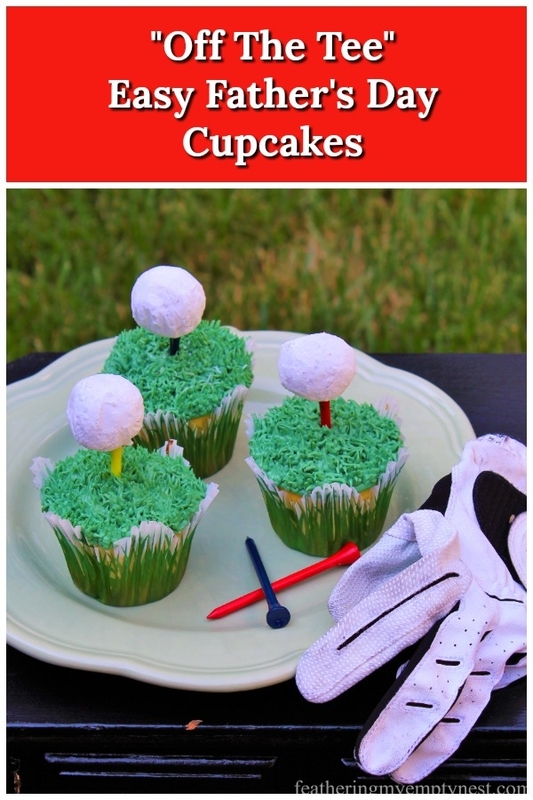 I think they turned out pretty cute and I think that any golfing dad would be very interested in hitting these “Off The Tee” Easy Father’s Day Cupcakes. This is a fun idea and I love your short cuts. It’s nice to have options. You have definitely given me some ideas to make some fun treats. Thanks, Deborah for your kind comment. Send my wishes for a Happy Father’s Day to Kenny. Oh my word, how cute and fun is this. Thanks so much for your kind comment, Marty. I really appreciate it! Wow, what a cute idea! Will definitely be stealing this for my golfing dad! Happy Fathers’ Day to the fathers in your life! Thanks so much for commenting. Hope your dad enjoys the cupcakes! Such a cute idea! 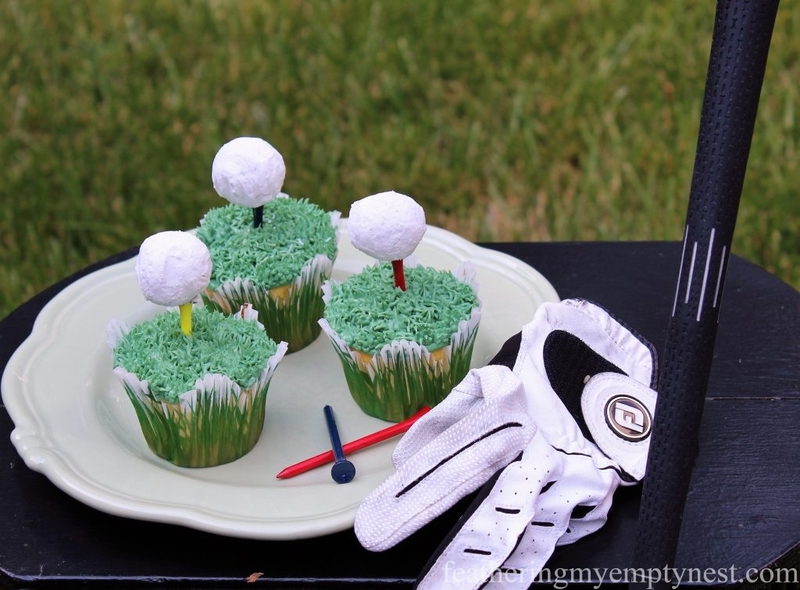 I love the powdered donut as the golf ball! Genius! Thanks, Jen for your kind comment. I hope the Dad’s in your life a very Happy Father’s Day! Thanks so much for commenting. 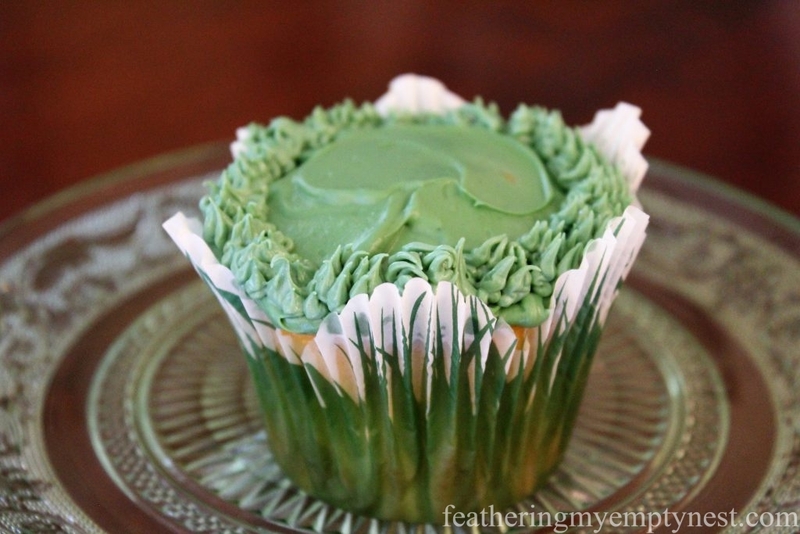 Yeah, wheatgrass cupcakes, yum!